Dr. Rob Jones, The Aquarium Vet, Will Now Contribute a Column for the Academy! This month we are pleased to add Dr. Rob Jones as a content contributor to the San Diego Zoo Global Academy newsletter. Dr. Jones joins our other esteemed new contributor, James F. Gesualdi, as regular columnists on their respective areas of expertise. In addition, each month we aggregate industry news and highlight a few of the headlines in the Zoo & Conservation News Highlights section of the newsletter. 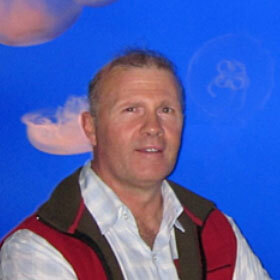 Dr. Jones is the Regional Veterinarian for the SeaLife aquariums in Australia and New Zealand. He also consults with Aquarium Industries (Australia’s largest importer and wholesaler of aquarium fish) and several zebrafish facilities and is servicing an increasing number of other clients. During the years, he realized that there was no shortcut to gaining knowledge in the aquarium field, so he has developed the world’s first online course for aquarists, the e-quarist course™, which was launched in May 2011. The San Diego Zoo Global Academy is excited to share an additional Academy subscriber benefit regarding our collaboration with Dr. Jones and his e-quarist courses. As an Academy subscriber, you are now entitled to a discount on the e-quarist courses. Greetings again from Down Under. This section will now become a regular feature for the SDZ Global Academy newsletter looking at all things aquarium related. Next month I will discuss how Aquarama in Singapore is now collaborating with the public aquarium industry. Also, look for more aquarium webinars coming up in the rest of 2015. It was my great pleasure in early March to share a table with the San Diego Zoo Global Academy at the Regional Aquatics Workshop (RAW) in beautiful Monterey Bay. This 29th RAW brought together almost 400 aquarists from all over the USA as well as several other countries. Three full days of presentations and social nights for networking, including the amazing Monterey Bay Aquarium, made for an excellent week. 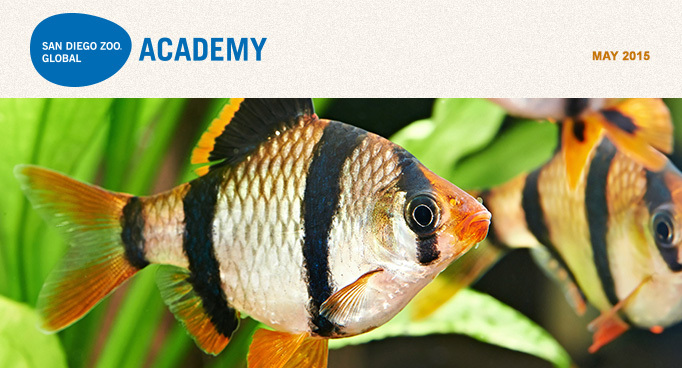 The Aquarium Vet and the San Diego Zoo Global Academy are working together to provide and enhance the online learning environment for all people working in the zoo and aquarium world. It is also with great pleasure and pride that I can announce that the Aquarium Vet e-quarist course™ has also been endorsed as an AZA Learning Partner. An AZA Learning Partner is a formally recognized organization or group that offers high quality training opportunities valuable to AZA members. Many of the AZA Learning Partner training opportunities qualify as electives for one or more concentrations in the AZA Professional Development Certificate Program. The time is now. Now is always the only time in which we can act, change, do something positive, including continuously improving ourselves and enhancing animal welfare. It starts with just one of us. One caregiver, one colleague, one leader, one animal, one small act or modification. One online course from the Academy. That’s it. From there, each of us and all of us can do so much more good. But let’s start at the beginning, one thing at a time, and go from there. Such a seemingly modest approach will surely bring us and the animals entrusted to our care to a better place than fretting over the difficulties of much bigger things and possibly squander the only time we have — which is now. Making the most of the “now” we have in the zoological world starts simply with being there. Being present in heart and mind and committed to improving upon our best for ourselves, each other, and the animals we serve. Examples abound of how to “be there." Starting at the top of the zoological organizations, board members, CEOs, executives, sponsors/supporters all must be engaged in the overriding mission of continuously enhancing animal welfare. Staff, volunteers, and others not ordinarily considered part of the animal welfare effort or team should be welcomed to the cause. A recent “Ask Animal Care” teleseminar with USDA APHIS Animal Care Regional Directors Dr. Elizabeth Goldentyer and Dr. Robert M. Gibbens included a report that the third most frequent — and perhaps most readily preventable — type of noncompliance with the Animal Welfare Act relates to structural condition, integrity, and strength at animal facilities. That alone shows the need for buildings and grounds, construction, and maintenance staff to be an integral part of AWA compliance, enhancing animal welfare and continuous improvement in the form of the Excellence Beyond Compliance® approach. The potential animal and human consequences of safety issues makes it clear that a safety expert or officer is also an important team member. Likewise, designers and event coordinators/planners and so many others need to mesh their activities with the accumulated knowledge and expertise of frontline caregivers, veterinarians, and others. Be there. Be there for each other. Be there for the animals. It starts with just one item, one conversation, one action. As it unfolds and grows, it’s “more than just the two of us." Be there. Arizona-Sonora Desert Museum In the Spotlight! The Arizona-Sonora Desert Museum has joined the Academy’s collaborative learning environment with their two privately branded custom sites, one for their employees and one for their volunteers. Welcome! 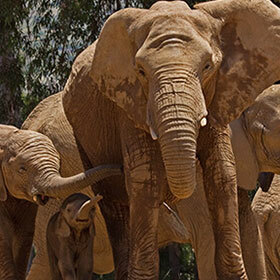 Keepers, interpreters, guides, and docents can dive into the fascinating world of elephants as the San Diego Zoo Global Academy presents Elephants, the newest module in Introducing Animals, our series about animal species and other taxonomic groups. The module explores the natural history and conservation of elephants. Remarkable images show elephants in ways you’ve never seen before, and video provides insights into their behavior. Interactivity sprinkled throughout the module engages participants in the learning process, and questions at the end of each section ensure that they have mastered fundamental concepts before they move on. The Elephant module takes about 90 minutes to complete, although participants progress at their own pace and may repeat the entire course or sections of the course as many times as they like. These modules are an awesome resource for interpreters, but they offer insights to veteran animal keepers too, providing a glimpse of natural history that helps keepers address husbandry concerns. This module addresses common questions and provides an up-close exploration of what elephants are all about. 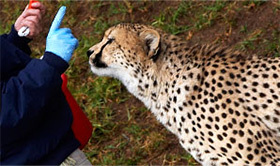 Whether you’ve worked with these animals for years or you’re a brand-new interpreter or docent, the module will equip you with a better understanding of these amazing animals. The Elephants module joins Cats, Orangutans, Great Apes, Lions, Cheetahs, Polar Bears, Giant Pandas, Tigers, and Gorillas in the Introducing Animals series. Look for modules about rhinos, marsupials, birds, and mammals coming soon. Please join us for the next Administrator's Users Group Webinar, hosted by Academy partner CypherWorx on Wednesday, May 20th at 11 a.m. PDT. Academy partner CypherWorx has a new Event feature on the Academy platform. The learner can click to get and/or create a new event they would like to announce in less time than it would have taken previously. You can now create customized fields to be filled when adding or editing events. Combined with the custom categories feature, there is a wide range of options to customize events. You have complete control over adding, editing, and deleting events. Intuitive controls give you the power to manipulate events with ease. One giant step is to have online training. One giant leap is to be able to integrate that online training into your operations. The Academy platform gives you tools to make that easier to do. In order to assign training to various parts of your operation, first create a reporting group for the applicable employees in a way that makes sense for your needs. An example would be to organize them by operating department. Then once that is done, go to the Assignments menu option and select that reporting group. 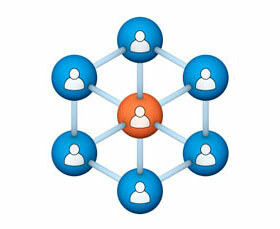 From there, select the employees that you wish to assign training to. Then, select the course you are assigning to them, and send out the assignment. They will receive notification of the assignment via email. Then you (assigner) can view a report at any time to track whether the employee (assignee) has completed the course. Volunteer Connection: Webinar "Maximizing Resources"
Volunteers are not free, and it takes a great deal of skill to manage their engagement appropriately while still accomplishing the goals of your organization. When resources are tight, how frequently do you hear, “just have the volunteers do it?" It’s easy to get overwhelmed with all there is to accomplish while swimming in a sea of volunteer requests. Learn skills and strategies for identifying the time and energy vampires you are dealing with, and how to flip them into efficient and effective practices that both save your sanity and accomplish your organizations goals. The Center for Young Worker Safety and Health at Georgia Tech Research Institute strives to coordinate and promote the efforts of health and safety training programs throughout the Southeast. In this course participants will learn about young worker injuries and illnesses, as well as ways to reduce them. This course will also identify workplace hazards and go over young employee rights under OSHA regulations and as defined by Department of Labor child labor laws.